Enjoy tasty Mediterranean flavors at your next cookout with our Grilled Greek Chicken Kabobs! Soaking chicken in a zesty marinade featuring vinaigrette dressing before grilling is the secret to our Grilled Greek Chicken Kabobs. Mix dressing and mayo in medium bowl. Add chicken; stir to evenly coat. Refrigerate 20 min. to marinate. Heat grill to medium-high heat. Remove chicken from marinade; discard marinade. Thread chicken and onions alternately onto 8 skewers. Grill 8 to 10 min. or until chicken is done, turning occasionally. Meanwhile, place lemon, cut sides down, on grill grate next to kabobs; grill until heated through. Place kabobs on plate. 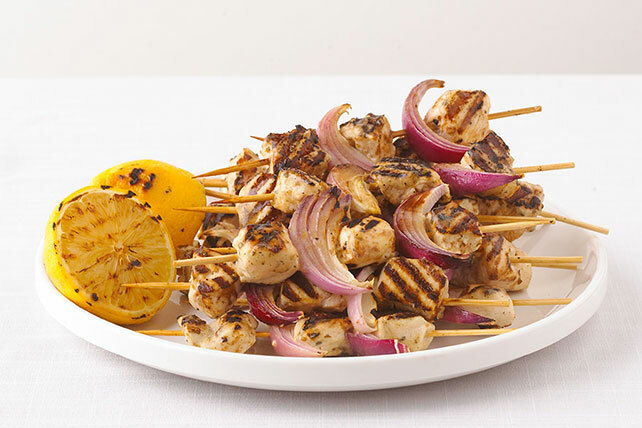 Squeeze lemon halves over kabobs.